Homemade panko crumbs are a cheap and healthy homemade alternative to store-bought. 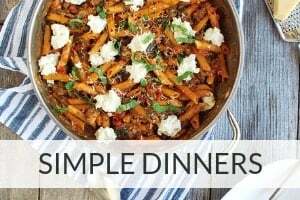 They’re so easy to adapt with different seasonings that can be used for all sorts of delicious recipes. Perfect for vegetables, chicken, fish, seafood, & more! Most home cooks know Panko is the king of all bread crumbs. Whether you’re making fish, seafood, chicken, or vegetables, I can’t think of a single “breaded” recipe that isn’t better with super light and crispy Panko crumbs! Why Make You Own Panko Crumbs? 2. To use fresher and healthier ingredients than boxed Panko. I try to limit GMOs, soy, and vegetable oils in my home kitchen and at least one of these is on the label of nearly every box of Panko you’ll find in the store or online. Fortunately, today’s homemade version has none of those, but looks and tastes just like traditional Japanese Panko! Remove crusts from sourdough and discard (or save for homemade croutons!). Cut sourdough slices into small cubes and divide among two baking sheets. Bake for 5-7 minutes, remove from oven and stir/flip, then return to oven for another 5-7 minutes. 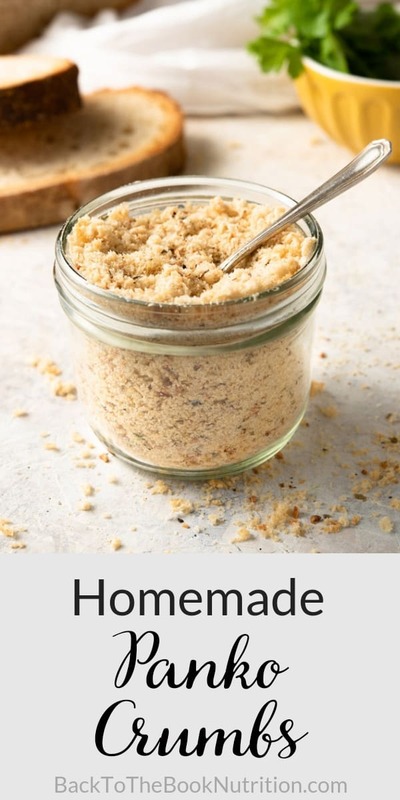 Remove the dried bread cubes from oven (leave the oven on for second baking) and, working in batches, pulse in a food processor for approximately 2 minutes per batch until coarse crumbs form. Tip: Be sure your crumbs are fairly uniform in size to prevent burning when using them to bread and bake fish, chicken, or vegetables. If making seasoned crumbs, stir in the 21 Seasoning Salute. Return the pulsed crumbs to the baking sheets and spread evenly around the pan. Bake for 8-10 minutes or until lightly golden. Remove from oven and allow to dry completely on the pan. 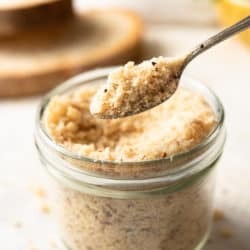 Store bought Panko crumbs aren’t going to break the bank, but this healthier homemade version still costs about 50% less. 1. Sourdough is made from just 3 simple ingredients: flour (I use organic Einkorn flour), water, and salt. 2. It involves natural fermentation, creating “good bacteria” that make the flour more digestible and allow it to rise without yeast. 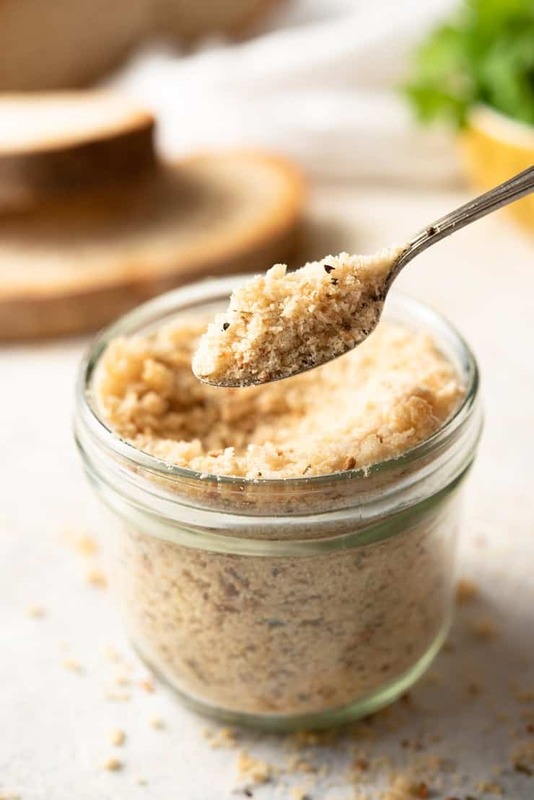 Beyond the cost savings and the health value of using homemade sourdough, it’s ultra light texture makes it perfect for Panko crumbs! Whether you season your panko is really a matter of preference. I like plain Panko for shrimp and other seafood, but prefer the seasoned version for breading fish (great fish recipe coming your way later this week! ), chicken, and vegetables. If you’re going the seasoned route, the simplest method is to use an all purpose seasoning – just be sure to avoid MSG and other unwanted ingredients when selecting one. I like Trader Joe’s 21 Season Solute, made from only dried herbs and spices. Keep an eye on the breadcrumbs so they don’t turn overly golden brown or burn. You’ll likely be cooking with them so they will brown again at a later stage. 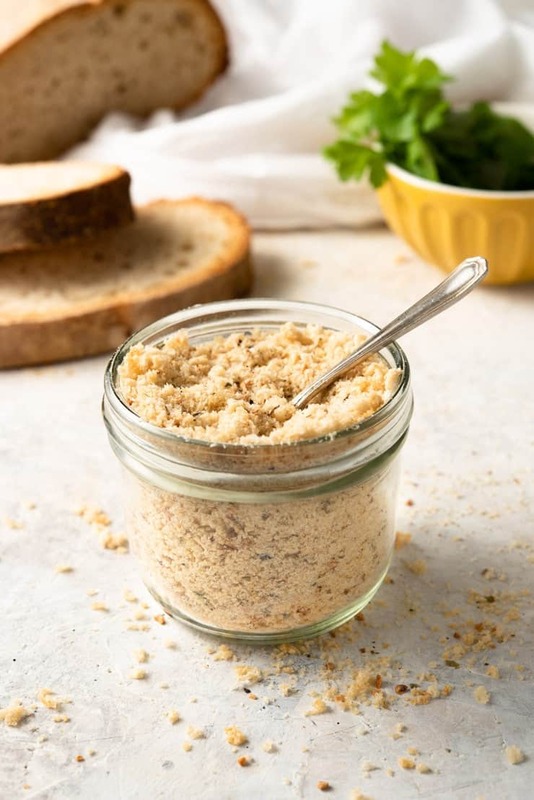 You can store these bread crumbs in an airtight container in the pantry or, to keep longer, in the freezer. You can easily adjust the seasonings for making all sorts of recipes. Why not try adding red pepper flakes, other dried herbs such as rosemary, thyme, parsley or spices such as cumin and paprika. Cut sourdough slices into small cubes and divide among two baking sheets. 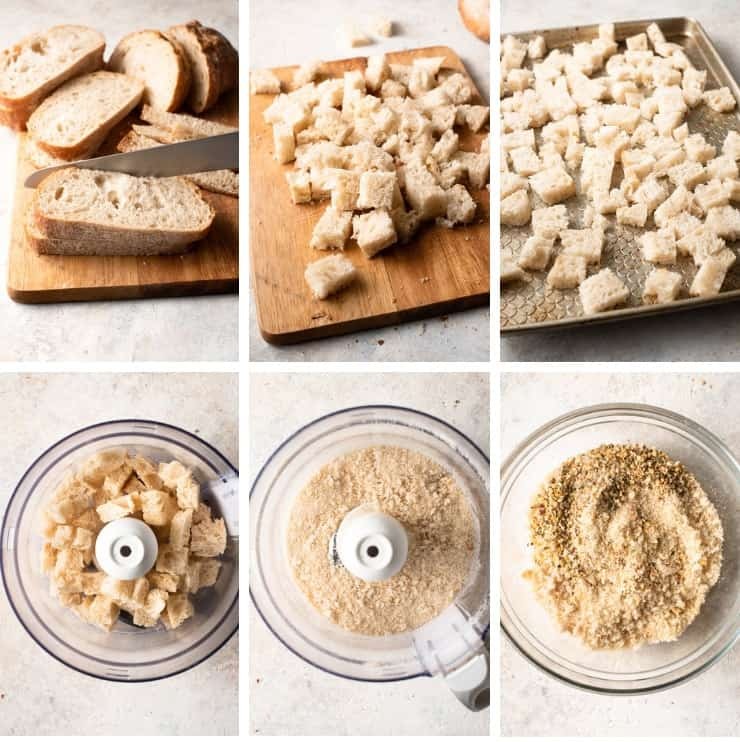 Remove the dried bread cubes from oven (leave the oven on for second baking) and, working in batches, pulse in a food processor for approximately 2 minutes per batch until course crumbs form. Be sure your crumbs are fairly uniform in size to prevent burning when using them to bread and bake fish, chicken, or vegetables. Return the pulsed crumbs to the baking sheets and spread evenly around the pan. Bake for 8-10 minutes or until lightly golden. Remove from oven and allow to dry completely on the pan. Store in an airtight container in the pantry or, to keep longer, in the freezer. Keep an eye on the breadcrumbs so they don't turn overly golden brown or burn. You'll likely be cooking with them so they will brown again at a later stage. Hi. I’ve never baked with einkorn flour but have been told that it’s not like baking with regular flour. Is there anything you do differently due to using this flour? Could you send me steps on how you make your sourdough bread please? Thanks for your question. I usually just add a touch more all purpose Einkorn than is called for in recipes (i.e., rounded 1 cup instead of a level 1 cup), but I’d defer to Jovial’s web site for expert tips on baking with Einkorn. They also have a sourdough recipe specific to Einkorn. I hope that helps! how much do these bread slices weigh in total? I’m really not sure. I typically measure instead of weigh. I will say the recipe is fairly forgiving so even if your sourdough loaf is a little larger or smaller than mine, it should work out just fine. 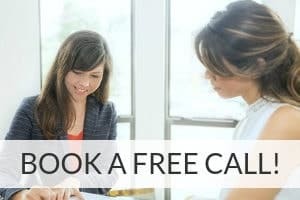 Let me know if you have other questions! Hi. Curious to know why you need to use 2 baking sheets. Why not just use one? I ask because I don’t need that many breadcrumbs for my recipe. 2 to 3 slices will due for my needs. Many, not all, of the recipes I use off the Internet I use as a guideline not necessarily to be executed exactly as written. So is there any reason other than the fact you’re using 10 slices of Boule type sourdough bread which are larger than the average loaf of bread? I love how easy it is to make these and they keep well for so long, great recipe!